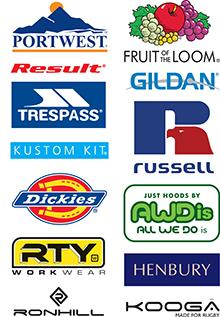 Shows the vast range of clothing that we offer from stock to be branded with your logo. We offer all types of promotional items to be branded with your logo, from pens to flip flops, we brand it all. SBS branding supplies promotional clothing and corporate gifts to a huge number of diverse organisations; from sports clubs, Leisure centres, charities, local businesses and multi-national companies. What they all have in common is that their promotional item must make a statement. This may be a simple logo and slogan on a polo shirt for staff to wear at a trade exhibition or a corporate gift with a marketing message. The one thing we know for sure about your promotional event is that the start date won't change - so ensure you use a company that fully understands your deadline, SBS Branding will ensure that this happens. © 2019 SBS Branding Ltd.